The Mini 4 is a compact, indoor, mains operated amplifier, designed for domestic and commercial use. The unit enables one aerial to supply four outlets simultaneously. 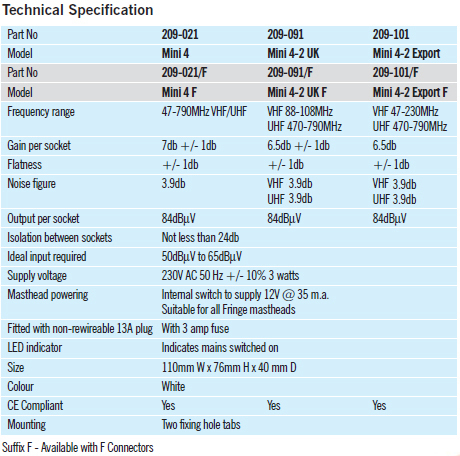 The single input socket is suitable for V.H.F. radio or V.H.F. T.V. and wide band U.H.F. television. Provisions are available to line power any Fringe model Masthead Amplifier, where reception is poor. The Mini 4-2UK is a compact, mains operated amplifier, designed for domestic and commercial use. The four outputs enable one aerial to supply four televisions and F.M. radios simultaneously. A separate input socket is available for FM radio. 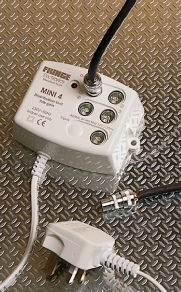 The Mini 4-2 Export is ideal for both FM radio and DAB. 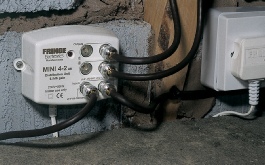 All Models available as standard coax socket, or with screw on F connections (/F variant).